I love writing Inspirational Western Romance because I'm busy #lovingthecowboy - my husband and son who are former and current professional rodeo bullfighters. And I'm fairly certain my previous career as a rodeo journalist and crime-beat reporter prepared me for life in Colorado wrangling Blue the Cowdog and mouse detectors Annie and Oakley. But every so often I take a break and do something different - like wrap Christmas presents. That's when I saw a sheet of wrapping paper with a snow angel on it. The idea for a Christmas novella sat right down in my mind and said, "Write me!" So I did. Hope you love it. 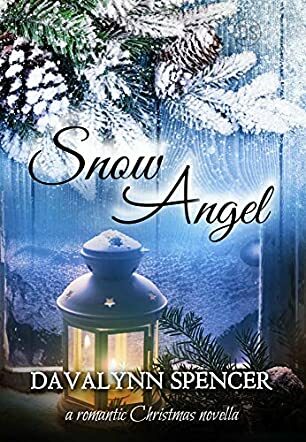 Snow Angel by Davalynn Spencer is a romantic Christmas novella set in the late 1800s in a small town in Colorado. A young Lena Carver plays in the snow outside her family's cabin when events tragically take a turn for the worse and she suffers a disfigurement which blights her life. Twenty years later and she is still unwed. Living and working with her brother, the local doctor, Lena has almost given up hope of finding a husband and having children of her own. One day her brother brings home a rugged cowboy who had been badly injured. Wil Bergman, who turns out to be the nephew of one of the townsfolk, had been attacked and robbed. Lena helps care for him while he mends and a spark of interest ignites between them. This is a delightful story about an unlikely relationship which blossoms out of tragedy and loss. Lena and her brother work hard for the community, often with little reward, so it was lovely to see these good people be given the opportunity for happiness. The fascinating subplot woven around a mysterious stranger, who periodically appears in their midst, serves to make this an even more magical and enchanting read. Davalynn Spencer certainly knows how to craft a special seasonal tale. It was truly heart warming and I was really sad to reach the end. Snow Angel is an ideal book for anyone who wants to indulge in a feel-good novel for the Christmas period or, indeed, any other time of the year.